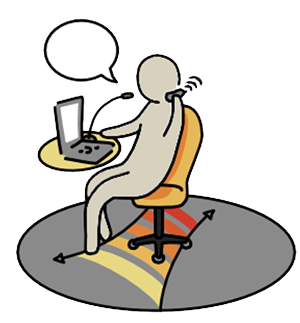 The Editorial paper written by Andrew Ravenscroft, “Social software, Web 2.0 and learning: status and implications of an evolving paradigm”, was ranked in the top 20 most downloaded articles from the Journal of Computer Assisted Learning in 2009. The paper was downloaded a total of 1598 times. The success of this Special Issue has led to a further Special Issue on the "Design and Evaluation of Social Media for Learning" that Andrew is co-editing with Steve Warburton, Stylianos Hatzipanagos and Grainne Conole, and members of the the MATURE team - Ravenscroft, Schmidt, Cook and Bradley - are also finalising an article for this based on the MATURE design methodology and formative evaluation. MATURE has presented the project results at the exhibition area of this year's Professional Training Facts 2010 and could establish contacts to various participants from industry. As part of the interview study, the interviewers have also collected rich, contextualized stories they have been told by their interviewees. They are very good instruments for understanding real-world problems and good practices with respect to knowledge maturing. Now we have published these stories. Some of them are rather short and to the point about a specific insight gained, others are much more elaborate case studies. 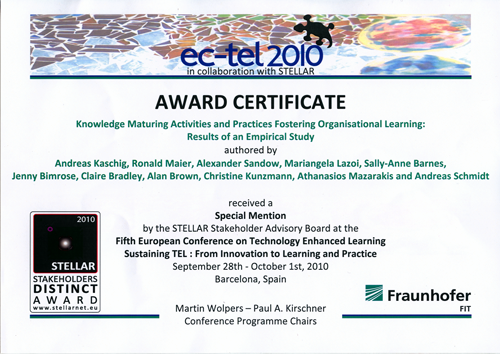 The MATURE paper on the findings on knowledge maturing activities from the interview study has won the STELLAR Stakeholder Distinct Award at ECTEL 2010. MATURE has organized the MATEL workshop at this year’s edition of the ECTEL conference together with the European projects IntelLEO and MIRROR. It was broadcasted to the ICT 2010 event in Brussels, and there is an archive of the video stream (choose Tuesday for the MATEL workshop). Presentation slides and papers are avaliable from the workshop page. It was a great workshop with lot of interactivity and true interdisciplinary audience. Andreas Schmidt opened the workshop with a keynote talk, setting the theme of the workshop and presenting results from the MATURE project. Contributions both from science and practice are welcome. Deadline is October 24, 2010. Alec Couros and Graham Attwell have been paired together as co-keynotes at the PLE Conference in Barcelona, Spain, July 8-9. The organizers have asked us to do something different than a typical keynote, so we have been thinking about an unKeynote format. In keeping with the theme of the conference (PLEs), we’re hoping that individuals in our network would be willing to help us frame what this might look like. MATURE has conducted a large-scale empirical study as part of the second year with 139 interviews from companies in various business sectors and countries in Europe (and beyond, e.g., in China). The goal was to deepen the understanding of real world maturing practices and barriers to knowledge maturing. Towards that end, MATURE project members have engaged in conversations about knowledge maturing phases, activities, indicators, and barriers. People Tagging demonstrator evaluation - the "simplicity is fabulous"
On May 11, the kick-off workshop for using the people tagging demonstrator as part of operational activities has taken place. Jenny Bimrose from University of Warwick and Simone Braun and Andreas Schmidt from FZI have introduced the people tagging system to an enlarged group of ten personal advisors at Connexions Northumberland after it had been substantially improved as a result of the participatory design phase with a core group from Connexions Northumberland.